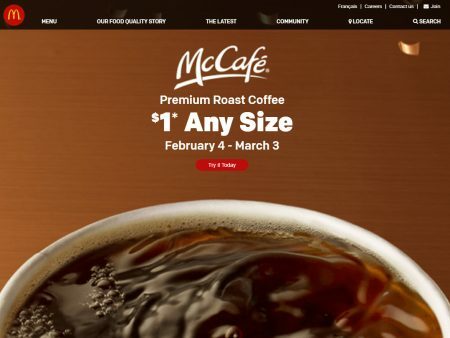 McDonald’s Canada popular Dollar Coffee promotion is back! For a limited time, enjoy any size McCafé Premium Roast brewed coffee for only $1 plus tax! It’s made from 100% Arabica beans with a consistently rich, smooth and delicious taste. The offer is available at participating McDonalds restaurants in Canada from February 4th to March 3, 2019. Not valid with any other McCafé beverage, or any meals, pairings or other offers. Click here to visit McDonald’s website for more details.